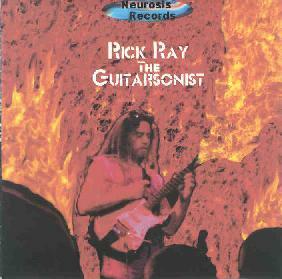 Rick Ray - "The Guitarsonist"
I had never heard of Rick Ray before and from looking at the CD and insert that was sent, this is one incredibely prolific guitar player. Rick released 9 CDs in 1999, 7 CDs in 2000 and 2 CDs in 2001. This is his 2nd release in 2002. All the CDs were recorded at the Neurosis Recording Lab in Euclid, Ohio. This CD is not just your guitar maniac ripping up the fretboard in an all instrumental jam frenzy. He is accompanied by Rick Shultz who plays clarinet on a few tracks, but other than that Rick plays all the instruments and sings. The opening track, "The Guitarsonist" is a great song, which really reminds me of Frank Marino a lot (I looked on his web page and he is a big admirer of Frank). "Psycho Sam" is next and features a lot of great clarinet playing, Beatles style vocals and some nice guitar. There are 15 songs on this CD and I don't want to go through them all but I would have to say that I enjoyed this CD a lot and I hope that I can hear more of Rick's stuff. You will find an incredible variety of material on this CD. Songs with samplers and a bit of electronica, pure hard rock guitar stuff, ripping instrumental stuff, etc... Very eclectic mix. I hope that Rick Shultz will play on the next CD as the songs he plays on are some of the best of the lot! Excellent self produced CD-R effort! I hope someone this prolific can keep up coming up with interesting material or perhaps this CD sounds just like all the others, I have no way to know.